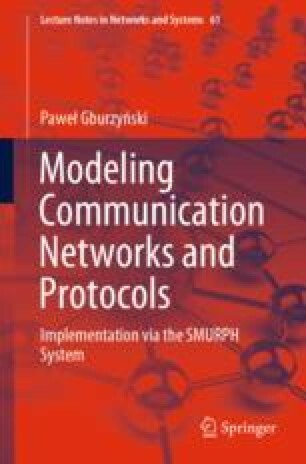 This book introduces a software system, dubbed SMURPH, comprising a programming language, its compiler, and an execution environment, for specifying communication networks and protocols and executing those specification in virtual worlds mimicking the behavior of (possibly hypothetical) real-life implementations. The level of specification is both high and low at the same time. High in that the specification, including the network configuration and its protocol (program) is expressed in a self-documenting, structural fashion; low in that the level of detail of the specification corresponds to a friendly view of the implementation, where all the relevant algorithmic issues can be seen without tying the description to specific hardware. I have collaborated with several people on research and industrial projects where SMURPH proved useful, or even essential. All those people have been credited in various places, more pertinent to the context of their contribution, so there is no need to mention them in this book, which is solely about SMURPH, for which I am modestly prepared to take full credit (and assume full responsibility). One of my collaborators, however, stands out in this respect. I mean my friend and first serious collaborator on protocol design, Piotr Rudnicki, who once, in 1986, drew on a piece of paper what must be seen today as the skeletal layout of the first ever SMURPH process, the transmitter of Ethernet. That picture forced me to discard my obscure collection of messy simulation programs and replace them with a unified simulation system good for them all. Piotr is no longer with us, as they say. His much premature departure has been a serious blow to reason and common sense. Too bad, because these days they need all the support they can possibly get.